Birding is great fun. 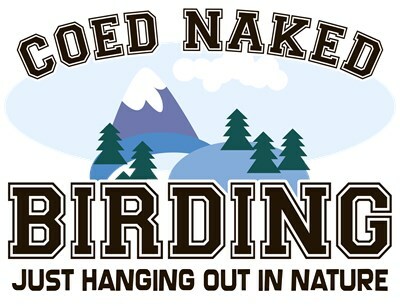 Coed Naked Birding is another kind of fun altogether. Either way you're going to be having fun just hanging out in nature. This cheeky design, inspired by a popular series of t-shirt designs from the late 1980s, is great for any birder who has a fun sense of humor. To order by phone, call toll-free at 1-877-809-1659 from Monday - Saturday 9:00am - 9:00pm EST. You'll need to note the Product Number 030-999469798 to make your order.